Keen to learn but short on time? Get to grips with the life of Princess Diana in next to no time with this concise guide. 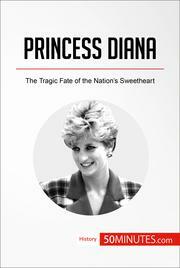 50Minutes.com provides a clear and engaging analysis of the life of Diana, Princess of Wales. Following her marriage to Prince Charles in 1981, she became a member of the British royal family, and from that moment on her private life became subject to intense media scrutiny. In the following years, accusations of adultery placed her marriage under increasing strain, even as her popularity with the British people grew because of her numerous commitments to charities and humanitarian organisations. She and Charles divorced in 1996, and just one year later, Diana was killed in a car accident in Paris. She remains one of the most beloved figures in recent British history. 50MINUTES.COM will enable you to quickly understand the main events, people, conflicts and discoveries from world history that have shaped the world we live in today. Our publications present the key information on a wide variety of topics in a quick and accessible way that is guaranteed to save you time on your journey of discovery.